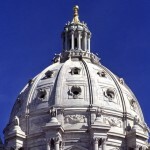 The Minnesota Coalition on Government Information hosts a discussion on initiatives in the next legislative session that could change the public’s access to government information. Issues include no longer requiring elected officials to comply with personnel section of the data practices act, requiring a six month delay between requests for the same data, and increasing the cost for copies of data. Concerns that government officials are too quick to turn to security classifications to deny access to public data will also be addressed. A recent example would be the refusal to list which public employees continued to work during the recent government shutdown. All six DFL candidates running for governor will appear at Minnesota's AFSCME convention in Duluth on Friday. The forum will be live-streamed here on The UpTake. No public notice was "an oversight" says Rep. Drazkowski about GOP plans to have "listening sessions" about property taxes. Senate Majority Leader Tom Bakk (DFL) and House Speaker Kurt Daudt (R) reveal their agendas and set expectations in this 2016 legislative preview at the Humphrey Institute.